San Patricio Melaque and Villa Obregón are the two adjacent beachfront villages that come together at the street Alvaro Obregón and make up the community referred to on this web page as Melaque. The village of San Patricio Melaque is to the west of Calle Alvaro Obregón and has been a vacation retreat for generations of Mexicans and more recently by Canadians. San Patricio Melaque is the larger of the two villages and contains the town square and most of the retail shops. Villa Obregón is to the east of Calle Alvaro Obregón and is more residential in character. The two villages form the largest coastal community between Puerto Vallarta and Manzanillo. As with any changing web content, you may need to use your Reload for Refresh button to see the most recent version of this calendar. Also see the Barra de Navidad Community Calendar. Sunday, March 18, 2018, 2:00pm. 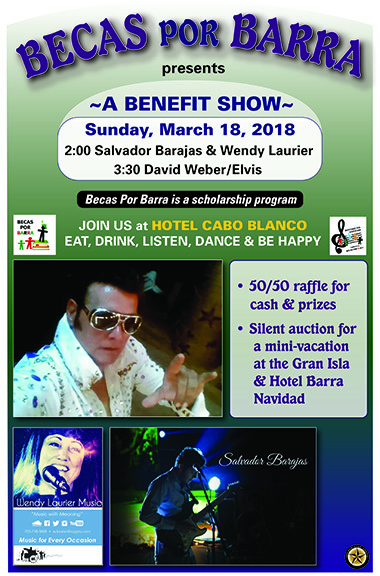 Becas por Barra (a scholarship program) presents a benefit show at the Hotel Cabo Blanco in Barra de Navidad, Jalisco. Eat, drink, listen, dance and be happy. 2:00pm Salvador Barajas and Wendy Laurier, 3:30pm David Weber (Elvis impersonator). Raffle for cash and prizes. Silent auction for a mini-vacation at the Gran Isla and Hotel Barra Navidad. Flyer. Melaque as seen from the air. See More Aerial Photos from tomzap's February 2010 Flight to Manzanillo. Melaque is located only 2 miles northwest of Barra de Navidad and shares the same long curving beach. Melaque does have numerous accommodations along the beachfront road which goes by Avenida Las Palmas to the west, Gómez Farías downtown, and Abel Salgado Velasco in the more residential area on the eastern end. Las Palmas terminates into an informal trailer park area that marks the end of the beach. A hiking trail, Andador Punta Melaque extends further along the coast. Unfortunately, there is no place for boats to dock since the beach is not suitable for this and the lagoon does not extend to the ocean. There are a couple of bus stations downtown and across the street is a bank (Banamex) with an ATM machine GPS 19°13.427'N 104°42.456'W, which is the best place to get your pesos. Note that the Banamex bank in Melaque will not change US or Canadian travellers cheques or cash to pesos unless you have an account with the bank! Four blocks back from the beach is the central plaza (GPS 19°13.53'N 104°41.31'W) where you will find a pharmacy, newsstand, post office and municipal building. Between the plaza and the beach is a large market. The traveling market comes to Melaque on Wednesdays. While I was there in early March 2000, they were having their Fiesta del Torros which included rodeo events and nightly fireworks. Playa Melaque is the main beach in Melaque. As in Barra de Navidad, the slope of the beach is somewhat steep which causes the waves to break close to shore. The beach is good for swimming but will present some difficulty for small children due to waves breaking on shore. The beach is rather long, extending from the jetty in Barra de Navidad to the west end of Melaque. Playa Melaque is not recommended for snorkeling, but if you proceed to the west end of town past the trailer park, a trail leads to a small but nice snorkeling area. See this map of the coastal area. Playa Cuastecomatito is a 200-meter long beach 1/2-mile west of the trailer park at the west end of Melaque. It can be accessed by hiking, by boat, or by a long dirt road off of highway 200. Most Melaque hotels listed are located on the beach. Other accommodations are available in Barra de Navidad, 2 miles to the east, and in Cuastecomates and La Manzanilla, a few miles to the west. Las Brisas Gomez Farias #9, Melaque, Jalisco, 48980, Mexico. (315) 355-5108. Agustín Gonzalez. Located in the center of town across from Banarama. Pool, rooms & bungalows, kitchens. US$33 high season (2/02). Bungalows Laguna del Tule at the end of Zafiro, which is off the end of Abel Salgado Velasco on the far east part of town. (315) 355-5395. (12/15) (GPS 19°13.00'N 104°41.58'W) Photo. Recommended. Double US$25. Bungalows Villamar 315-355-5005. Hidalgo #1. On the beach, 200 yards past the RV Park. 4 rentals US$18 - $40. Couple of RV spaces. English spoken. House for Rent 128 Ramon Corona St. Dr. Roberto Pimienta Woo. (315) 355-5077. Email: drwoo@nautilus.melaque.udg.mx. 5 bedrooms. Vista Hermosa Gomez Farias #23. (315) 355-5002. issachavez@hotmail.com Next to the bank machine. Kitchenettes and regular rooms available, also bungalows, pool. US$33 high season (2/02). Bungalows Mayorca (315) 355-5219 voice/fax. Abel Salgado Velasco #133. GPS: 19°13.29'N 104°41.88'W. 3-story 2-bedroom beachfront bungalows with kitchens, pool, barbeque areas, Wi-Fi, air-conditioning, cable TV. bungalowsmayorca@prodigy.net.mx. Hotel de Legazpi Avenida las Palmas #3, west end of town. (315) 355-5397. legazpi1@insightbb.com (English), hoteldelegazpi@prodigy.net.mx (Espa&ntile;ol). P.O. Box 88, San Patricio-Melaque, Jalisco 48980. Some rooms with kitchenette, $50. Photo. Bungalos Orientales (315) 355-5751, 355-5750, 684-3482 (fax Attn: Bungalows Orientales). Abel Salgado #9. Shaded pool area, enclosed parking, not air-conditioned, many rooms. Photo. b_orientales@hotmail.com ~US$48 (3/10). Hotel Monterrey (315) 355-5004. Email hotelmonterrey@prodigy.net.mx. located downtown on Gómez Farías near bus station. (GPS 19°13.41'N 104°42.43'W). Rooms, bungalows, pool, attractive. Photo. US$46 (10/01). Hotel Club Nautico Gómez Farías #1, west end of the street. (315) 355-5774, (315) 355-5776. air-conditioned, small pool, restaurant El Dorado, TV, phones. (GPS 19°13.41'N 104°42.58'W) Photo. Posada de Cervantes (315) 355-6574. posadadecervantes@hotmail.com. Calle Abel Salgado 132, across from the Mallorca. 7 bungalows with kitchens. AC, cable TV, fans, pool, restaurant. $42, $57 (5/00). Photo. Posada Pablo de Tarso Avenida Gómez Farías 408, east of downtown. (315) 355-5117, 355-5268. Air-conditioned, TV, phones, attractive courtyard, $40 and up. info@posadapablodetarso.com. Photo. Melaque Puesta del Sol located downtown on Gómez Farías. (GPS 19°13.42'N 104°42.34'W). Bungalows, rooms, suites, some with kitchenettes and/or air-conditioning, pool, TV, covered parking. US$40 hotelpuestadelsol@gmail.com (1/14). Hotel Casa Grande on Avenida Las Palmas on the west side of town was Melaque's largest and best hotel but was destroyed in the earthquake of October 1995 and it does not look as though it will be rebuilt. Villas Camino del Mar just off of Abel Salgado Velasco on Fransisco Villa, on the east end of town. (315) 355-5207, 355-5498 (fax). 4-story, pool, parking garage. P.O. Box 6, San Patricio-Melaque, Jalisco 48980. Photos. Trailer Park Playa Located downtown on the beach at Gómez Farías and Lopez Mateos. (315) 355-5065. Av. Gómez Farías #250, San Patricio-Melaque, Jalisco 48980. RV hookups. Photo. Quemex Calle Las Palmas, in front of the big hotel destroyed in earthquake. Full hookups. An informal trailer park, no hookups, is located at the west end of Avenida las Palmas. Photos. Alcatraz upstairs, near trailer park. Try their Chicken Special (Pollo Estilo Alcatraz) slices of sautéed chicken, onions, green peppers, served in a hot stone bowl. Also excellent, garlic shrimp (with or without shells). Dine in their upstairs palapa while watching the world go by in the streets below. Recommended. Restaurante Aurora's Great lunches; try the shrimp salad. Recommended. Ayala Calle Carrillo Puerto #66 corner of Ramon Corona. Located on a small street near the trailer park. Homestyle Mexican cooking. Recommended. Don Bigote's on the beach. GPS 19°13.382'N 104°42.346'W. Restaurant and bar. Happy hour 2pm - 9pm and Bingo on Tues and Fri afternoons. Open late. Good food, popular. Cafeteria La Marina San Patricio Closed. Gomez Farias 55 and in front of the beach. Mexican food. lamarinacafe@hotmail.com. Club Dorado located on the beach in a large palapa. Open all day, live music sometimes, somewhat pricier than others. Popular. La Flor del Cafe (315) 108-7763. Gómez Farías #303. Great fruit plate. Flor Morena on the square, open 5 pm - 11 pm. Melaque's most popular restaurant. No seafood except shrimp, pozole on Sundays. The pozole is recommended, inexpensive. The Frog (315) 355-8779. Esmeralda #33. Barbequed ribs on Wednesdays and Saturdays. El Guerrillero Alvaro Obregon, 4 blocks from the beach. Homemade tortillas, grilled chicken and steaks. Hamburgesa Maui Tortas, hamburgers and fries. Market The village market is located on R. Corona at Lopez Mateos. This is a block from the zócalo toward the beach. Small stands serve inexpensive meals including sushi. Vanailla y Pimiento Alvara Obregón, 1/2-block from the beach, former location of Restaurante Maya. GPS: 19°13.34'N 104°42.10'W. Excellent food, pretty setting, most attractive restaurant in Melaque. La Oficina Calle Revolution #41. El Pirata Hot Dogs at the zócalo in the evenings. Las Palmas located on the beach. Good seafood, hospitality, economical. Open until sunset. El Patio Gomez Farias #14, across from Hotel loas Brisas. "Ouellette tortilla flat" is recommended. Red Lobster (315) 355-6424. Alejandrina #123, corner of Vicente Guerrero and Alejandrina. GPS: 19°13.25'N 104°41.80'W. Seafood. Highly recommended for its lobster, other seafood and value. Take some mosquito repellant. Listed in the Best of Melaque. Roosters (315) 355-5262. New location on the beach across from Bigotes. Popular for breakfast. Open daily 8 am to 1 pm for breakfast. Soon to open for dinner. 11/09 Listed in the Best of Melaque. La Salamandra Abel Salgado #382. (315) 355-6479. Good food. Service is often slow. Siete Estrella west side of plaza. Breakfasts, burritos, guacamole, hamburgers, etc., and very good fresh fruit liquados (milkshakes). Reasonable. Tacos Scooby Alvaro Obregon at Emiliano Zapato. Prime rib on Sunday. Recommended. (1/14) Listed in the Best of Melaque. Taco Surf Taco stand on taco row. GPS: 19°13.52'N 104°42.28'W. Voted best tacos in Melaque in the Best of Melaque pole. La Terraza (315) 355-5313. Gordiano Guzman #4, 4 blocks east of the bus terminal. Wi-Fi. Good breakfasts, homemade bread, sticky buns, English spoken, ocean view. Terraza Cortez on the beach. Thrifty Ice Cream near the plaza. Lots of flavors. Venustiano Carranza #13. That is the address, because the restaurant has no name. Only a small Coca-Cola sign marks the site and the restaurant is only open in the evening. Tables and chairs and the kitchen itself are carted out front for the evening meal and then taken away at closing. The restaurant does a lively takeout business with customers taking away family-sized meals and the onsite tables are often filled. The food is homestyle (pozole, tostadas, etc. ), low fat, and is only lightly seasoned--you add the salt, lime, and salsa to taste, so it is good for those who want to control those ingredients. Recommended. (2/10) See the La Paloma Where to Eat? Guide. Villa Obregon Fiestas Late January/early February. Daily parades, music, bull riding. Día de San Patricio March 17. More celebration during the week prior to St. Patrick's Day. Fiesta de Toros Week of St. Patrick's day in March. Bull riding, parades. Semana Santa Easter holy week. A major holiday throughout Mexico. Accommodations may be scarce. Feast of the Assumption of the Virgin Mary August 15. A 9-day celebration with a morning and evening parade every day. Tomzap Party Long-running annual celebration held in mid-February organized in the tomzap.com Visitors' Comments forum by its participants. Walking: The town is so small that for the most part you can get around on foot. Taxis: There are taxis available at the bus station on Calle Gómez Farías and at the central plaza. The driver of taxi #8 has been described as belligerent and intimidating, bordering on psychotic. (02/02) A more recent report described the driver, Javier (perhaps a different person), as cordial and pleasant.  (01/05) Another rider confirms belligerent and intimidating, bordering on psychotic" and notes that he is capable of normal behavior at times but overcharged her on a standard fare and wouldn't listen to reason until confronted before his peers. (04/07) Just avoid Javier, taxi #8, and take a different taxi. Air: Melaque is located near the Manzanillo airport which is served by several international carriers. This includes flights on America West from Arizona and Aeromar out of San Antonio. There is a dirt landing strip just northwest of Barra de Navidad (through the barrio and left at the fork). Runways 22/04, approximately 3700' in length, unlighted, 40' trees at southwest end. Bus: Terminal Autobuses Primera Plus. (315) 355-5003. The main bus terminal is on Calle Gómez Farías across from the Banamex. There are frequent departures to Manzanillo and other points, plus a local shuttle between Melaque and Barra de Navidad. The local bus can take you to nearby Barra de Navidad for $6 pesos (5/10). The service is described as better than walking and is a great way to meet the locals. To drive from Laredo, Texas to Melaque is about 800 miles and takes 20 hours. Flight to Manzanillo tomzap's February 2010 flight to Manzanillo in a Piper Arrow which included photo-taking flights over Melaque. Hwy 200 is the coastal highway that connects the towns along the coast. Hwy 80 connects Guadalahara to the coast. Insurance: AHA Insurance (855) AHA-5384 (toll free in U.S. and Canada). Auto, homeowners, medical insurance for U.S. and Canadian citizens in Mexico. Medical insurance for Mexican citizens traveling outside of Mexico. Tairyo bait & tackle shop. Cedro N. 40 Punta Melaque (at the end of Primavera towards the ejido campground). (315) 353-1473. Maria Antionieta Muñoz. Supplies for commercial or sport fishing. Help keep this information current. Email tom@tomzap.com with updates. Ayúdenme a mantener ésta información al día. Envía tus actualizaciones pore-mail a tom@tomzap.com. Article: Hip Replacement in Manzanillo a story by Greg Mason. Article: A Medical Emergency a story by Nancy Lennie of medical treatment in Mexico. Article: Medical Care in Ajijic Story of a knee replacement. Chiropractor: Juan José 045 (315) 106-9134. Casa de Sobado La Pareja, located at #6 Lopez Mateos at the corner of 18 de Septiembre in Jaluco. Limited English. $75 pesos/hr. Recommended (1/15) See testimonial. Clinic Clinica IMSS Centro de Salud. Gordiano Guzman #11. (315) 355-5880. Government-supported free clinic. Dentist: Dr. Laura Ballesteros Cobian. Av. Veracruz, No 174, Local 1, Barra de Navidad, Jalisco. (315) 355-6179. Doctor: Dr. Roberto Pimienta Woo. Family practice. Located at Ramon Corona #128. (315) 355-5077 voice/fax. English speaking, also knowledgeable in alternative medicine and iridology. Emergency: Civil Protection System km. 1.5, Hwy 80, Melaque. (315) 355-6375 and 355-6376 (voice/fax). Ambulance, firefighting, rescue, disaster relief services. Emergency: Clinica de Urgencias. Calle Venustiano Carranza #22. (315) 355-6144. Monday - Friday 8am - 3pm, Saturdays 8am - noon. Emergency: Red Cross (315) 355-2300. Cihuatlán. Ambulance. Group: Friends of Bill W. - Alcoholics Anonymous English-speaking group meets at San Patricio by the Sea Church, 5 pm on Wednesdays and Sundays. Pharmacy: Farmacia San Miguel E. Zapata #1, at the corner of Av. Obregón in Villa Obregón, half a block from Tacos Scooby. Pharmacy: Súper Farmacia Plaza (315) 355-5167. López Mateos #48, on the corner at Plaza Principal. Large pharmacy favored by the locals. Sea Side Reservations (315) 355-0116 (Mexico), (315) 108-6713 (cell in Mexico), (205) 409-0594 (USA). Vacation rentals in Barra de Navidad and Melaque areas. seasidebarradenavidad@gmail.com. 1995 Earthquake 8.0 earthquake centered 15 km east of Manzanillo, Colima. 2007 Hurricane Henriette brought heavy rains and flooding to the area. Almacenes Parisany Grocery on Morelos across from the Secondaria. Good selection, reasonable prices. Andador Punta Melaque Scenic oceanside walkway at the west end of Playa Melaque. Best of Melaque A rundown on the best that Melaque has to offer according to the readers of tomzap.com. Church: Costalegre Community Church (315) 355-8233. On Alvaro Obregon. Multi-denominational English speaking church meets Sundays at 10am. GPS: 19°13.52'N 104°41.89'W. See map. Computer Repair 355-8917. Omar in Villa Obregon. Will travel. Civil Protection System km. 1.5, Hwy 80, Melaque. (315) 355-6375 and 355-6376 (voice/fax). Ambulance, firefighting, rescue, disaster relief services. Friends of Bill W. - Alcoholics Anonymous English-speaking group meets at San Patricio by the Sea Church, 5 pm on Wednesdays and Sundays. Delegación de Villa Obregón Benito Juarez, near the taxi stand. Municipal office for Villa Obregon. Farmacia Central on Lopez Mateos, not far from the mercadito. Recommended. Fruterias Hawaii López Mateos #45, near Plaza Principal. GPS: 19°13.50'N 104°42.33'W. Grocery store favored by locals. Photo. Golf There are two golf courses nearby. One is at the Grand Bay on Isla de Navidad, and the other is at the new resort Tamarindo, which is five minutes east of Melaque. The Guide to Barra de Navidad, Melaque - San Patricio - Villa Obregon is available in many stores for 5 pesos. (315) 355-8357. The Guide is published by Carmelo Lodise about one a month and features articles on local topics, maps, and advertisements for local businesses. LaGuiaBarra@yahoo.com. Laundry A lavanderia (laundromat) is located at the corner of Clemente Orozco and Las Cabañas. Same day service. Recommended. Panaderia Melaque Benito Juarez 32B. GPS: 19°13.51'N 104°42.23'W. Provides the baked goods for all of Melaque. Product may be purchased direct at this location. Police San Patricio Melaque. Calle López Mateos #52 (upstairs). (315) 355-5080. Police Villa Obregon. Av. Benito Juarez #510. (315) 355-6090. Police Policia Federal Preventiva. Hwy 80 y Hwy 200. (315) 355-6225. Post Office calle Clemente Orozco #56, between V. Gomez Farias & Ramon Corona. The post office serves the Melaque and Barra de Navidad area, 8am-3pm M-F, Saturday 9am-1pm. Plaza de Toros San Patricio Miguel Hildalgo at Hwy. 200. Bull-fighting ring. Plaza Principal main square in San Patricio Melaque. Roxa's 044 (315) 100-9887. Vicente Guerrero #16, just a half block up the street from Restaurant Bar Ava. Shoe Repair: Taller de Calzado, Los Mister (315) 112-8628. Located in a small kiosk on the square near the OXO store. Recommended. Sound of the Gas Truck In Melaque, trucks selling gas or water slowly cruise the streets, each with its distinctive annunciation to let customers know of their presence. Sound byte: Gaas (.6MB). Tarzan water truck Short movie and sound (4.2MB) of this familiar event. Translation Services Sara Starkman Translations. English/Spanish. sarah_js86@hotmail.com. U.S. Consulate (322) 222-0069. Paradise Plaza, Paseo de los Cocoteros #1, Local #4, Interior #17, Nuevo Vallarta, Nayarit. Tiangas Market Weekly market held on Wednesdays.